The Gordon Setter is a good-sized, sturdily built, black and tan dog, well muscled, with plenty of bone and substance, but active, upstanding and stylish, appearing capable of doing a full day's work in the field. He has a strong, rather short back, with well sprung ribs and a short tail. The head is fairly heavy and finely chiseled. His bearing is intelligent, noble, and dignified, showing no signs of shyness or viciousness. Clear colors and straight or slightly waved coat are correct. He suggests strength and stamina rather than extreme speed. Symmetry and quality are most essential. A dog well balanced in all points is preferable to one with outstanding good qualities and defects. A smooth, free movement, with high head carriage, is typical. Size-Shoulder height for males, 24 to 27 inches; females, 23 to 26 inches. Weight for males, 55 to 80 pounds; females, 45 to 70 pounds. Animals that appear to be over or under the prescribed weight limits are to be judged on the basis of conformation and condition. Extremely thin or fat dogs are discouraged on the basis that under or overweight hampers the true working ability of the Gordon Setter. The weight-to-height ratio makes him heavier than other Setters. Proportion The distance from the forechest to the back of the thigh is approximately equal the height from the ground to the withers. The Gordon Setter has plenty of bone and substance. Head deep, rather than broad, with plenty of brain room. Eyes of fair size, neither too deep-set nor too bulging, dark brown, bright and wise. The shape is oval rather than round. The lids are tight. Ears set low on the head approximately on line with the eyes, fairly large and thin, well folded and carried close to the head. Skull nicely rounded, good-sized, broadest between the ears. Below and above the eyes is lean and the cheeks as narrow as the leanness of the head allows. The head should have a clearly indicated stop. Muzzle fairly long and not pointed, either as seen from above or from the side. The flews are not pendulous. The muzzle is the same length as the skull from occiput to stop and the top of the muzzle is parallel to the line of the skull extended. Nose broad, with open nostrils and black in color. The lip line from the nose to the flews shows a sharp, well-defined, square contour. Teeth strong and white, meeting in front in a scissors bite, with the upper incisors slightly forward of the lower incisors. A level bite is not a fault. Pitted teeth from distemper or allied infections are not penalized. Neck long, lean, arched to the head, and without throatiness. Topline moderately sloping. Body short from shoulder to hips. Chest deep and not too broad in front; the ribs well sprung, leaving plenty of lung room. The chest reaches to the elbows. A pronounced forechest is in evidence. Loins short and broad and not arched. Croup nearly flat, with only a slight slope to the tailhead. Tail short and not reaching below the hocks, carried horizontal or nearly so, not docked, thick at the root and finishing in a fine point. The placement of the tail is important for correct carriage. When the angle of the tail bends too sharply at the first coccygeal bone, the tail will be carried too gaily or will droop. The tail placement is judged in relationship to the structure of the croup. Shoulders fine at the points, and laying well back. The tops of the shoulder blades are close together. When viewed from behind, the neck appears to fit into the shoulders in smooth, flat lines that gradually widen from neck to shoulder. The angle formed by the shoulder blade and upper arm bone is approximately 90 degrees when the dog is standing so that the foreleg is perpendicular to the ground. Forelegs big-boned, straight and not bowed, with elbows free and not turned in or out. Pasterns are strong, short and nearly vertical with a slight spring. Dewclaws may be removed. Feet catlike in shape, formed by close-knit, well arched toes with plenty of hair between; with full toe pads and deep heel cushions. Feet are not turned in or out. The hind legs from hip to hock are long, flat and muscular; from hock to heel, short and strong. The stifle and hock joints are well bent and not turned either in or out. When the dog is standing with the rear pastern perpendicular to the ground, the thighbone hangs downward parallel to an imaginary line drawn upward from the hock. Feet as in front. Soft and shining, straight or slightly waved, but not curly, with long hair on ears, under stomach and on chest, on back of the fore and hind legs, and on the tail. The feather which starts near the root of the tail is slightly waved or straight, having a triangular appearance, growing shorter uniformly toward the end. (8) A white spot on the chest is allowed, but the smaller the better. Disqualification - Predominantly tan, red or buff dogs are ineligible for showing and undesirable for breeding. A bold, strong, driving free-swinging gait. The head is carried up and the tail "flags" constantly while the dog is in motion. When viewed from the front, the forefeet move up and down in straight lines so that the shoulder, elbow and pastern joints are approximately in line. When viewed from the rear, the hock, stifle and hip joints are approximately in line. Thus the dog moves in a straight pattern forward without throwing the feet in or out. When viewed from the side, the forefeet are seen to lift up and reach forward to compensate for the driving hindquarters. The hindquarters reach well forward and stretch far back, enabling the stride to be long and the drive powerful. The overall appearance of the moving dog is one of smoothflowing, well balanced rhythm, in which the action is pleasing to the eye, effortless, economical and harmonious. The Gordon Setter is alert, gay, interested, and confident. He is fearless and willing, intelligent and capable. He is loyal and affectionate, and strong-minded enough to stand the rigors of training. Predominantly tan, red or buff dogs. Click Here to Learn about breeder background checks on Gordon Setter breeders if you are looking for Gordon Setter puppies for sale. Click Here to learn how ResearchBreeder.com can help you find healthy Gordon Setter puppies for sale. Click Here to order a Breeder or Kennel Background Check on Gordon Setter Breeders that may have Gordon Setter puppies for sale. Click here to find the national breed club for Gordon Setter puppies for sale. 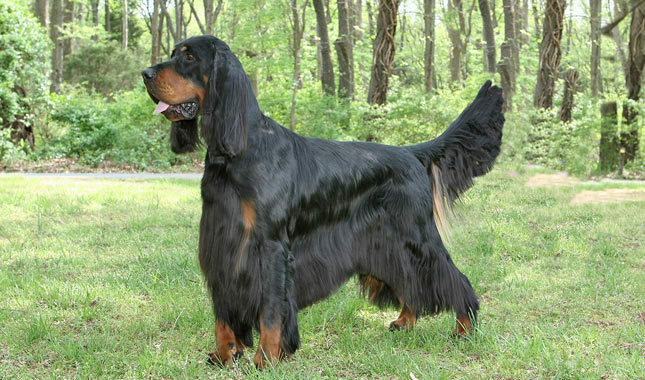 Click Here to purchase a list of approved ResearchBreeder.com Gordon Setter Breeders who have Gordon Setter puppies for sale.